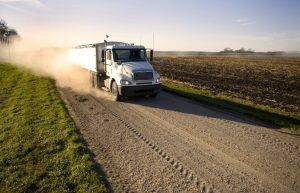 Often this journey takes a stop at a third-party cleaning and processing plant, to remove dockage and load the grain into a bag, tote or container. The cleaned grain might then go back to the farm to be sold as cleaned and bagged at a higher price. Alternatively, some buyers purchase grain ‘farmer-dressed’ or ‘non-commercially cleaned’, send it for processing themselves, then re-sell it to their next-use market. More often than is the case for conventional grain, dockage on organic grain may be held aside by the cleaning plant allowing the owner to take it home or market it as organic feed. Any time organic grain is being shipped in bulk, the seller is responsible for preserving quality and integrity until it arrives at the final destination, even when rail cars or a third-party commercial trucking company are used. Truckers are expected to show wash certificates to the farmer before they load organic grain from the bin, but this does not guarantee that the insides of the trailers are clean. Upon inspection, if the farmer sees kernels from the previous load caught in crevices inside the trailer, they must consider turning the truck away or getting it cleaned before loading. The cost of doing so plus the hassle is likely still far less than the costs involved in having the load rejected at delivery. Producer cars are starting to come into use in shipping organic grain crops in bulk, but here again lies a risk of the railcars not being clean enough, which the farmer can’t control or predict ahead of ordering. Still, there is a substantial cost savings to using producer cars on long hauls versus trucks and containers. Increasingly, Prairie farmers are getting to know buyers of organic crops within North America and across Canada. Thanks to technology and increasingly sophisticated farm marketing practices, modern organic farmers have been telling their stories to a growing network beyond western Canada. Coupled with new logistics efficiencies and better ways to build business relationships, modern organic farmers are adding value simply through direct selling to their food company and consumer customers.